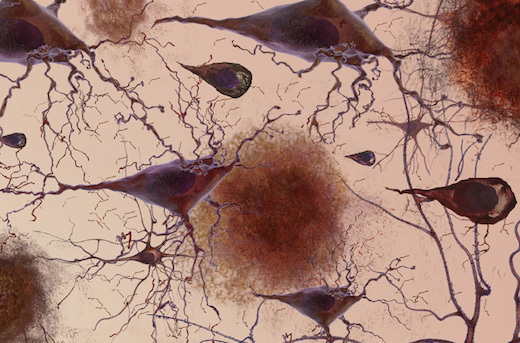 Illustration of neurons and amyloid plaques, courtesy of the National Institute on Aging. Proteomics -- analyzing in an "unbiased" way how all the proteins in the brain accumulate or disappear -- could provide clues to alternative mechanisms and even treatment strategies, scientists think. Proteomics – analyzing in an "unbiased" way how all the proteins in the brain accumulate or disappear – could provide clues to alternative mechanisms and even treatment strategies, scientists think. Researchers at Emory University School of Medicine have performed the first large-scale analysis of post-mortem brain proteins in Alzheimer's, using systems biology tools previously reserved for gene expression data. Comparing samples from Alzheimer's patients with those from healthy elderly controls and patients with other neurodegenerative diseases, the team identified networks of changing proteins that were specific to Alzheimer's. Putting together protein and gene data, the scientists saw patterns pointing to the importance of inflammation and certain cell types, such as microglia, the brain's scavenger immune cells, which gobble up amyloid plaques. The results were published in Cell Systems on Dec. 15. "Our findings make a significant contribution towards understanding the earliest molecular changes at the protein level in human brain, which are linked to Alzheimer's pathogenesis and cognitive decline," says co-lead author Nicholas Seyfried, PhD, assistant professor of biochemistry and neurology at Emory University School of Medicine and director of the Emory Integrated Proteomics Core. This paper is the first proteomics study emerging from the Accelerating Medicines Partnership for Alzheimer's Disease, a $92 million collaboration between the National Institutes of Health and major pharmaceutical companies. "The purpose of this project is to employ large-scale unbiased discovery approaches using postmortem human brains to identify changes in protein networks that are most closely linked to cognition and the hallmark neuropathology, especially those changes that occur in the earliest, preclinical stages of disease," says Allan Levey, MD, PhD, chair of neurology at Emory University School of Medicine and director of Emory's Alzheimer's Disease Research Center. Emory investigators collaborated with the Baltimore Longitudinal Study of Aging, (BLSA), which provided brain tissue from people diagnosed with Alzheimer's disease (AD) and healthy elderly controls, as well as those defined as having "asymptomatic AD"; that is, people with normal cognition, but who at death had pathological signs of AD, including amyloid-beta plaques. By looking at this unique set of brains, researchers could tease out protein signatures involved in preclinical versus symptomatic disease states. "It's been known for some time that many older people have amyloid buildup without having symptoms of Alzheimer's," Levey says. "This group is particularly important, because this is includes people in the preclinical stages of the disease who likely would have developed symptoms if they had lived longer, and thus represents the first stages of disease progression. However, it could also include people who have a cognitive reserve, or have some biological mechanisms of resilience against the negative effects of amyloid." For almost all of the BLSA cases, comprising 97 individual samples, two regions of the brain's cortex were examined. In addition, the team validated their findings by comparing them against 32 samples from the Emory ADRC brain bank, which included healthy controls and those with AD, Parkinson's disease and ALS (amyotrophic lateral sclerosis). This allowed the team to identify early protein changes in the preclinical stage of AD, as well as those that were AD-specific. The investigators also compared their findings with previously published data on gene expression (RNA, which shows how genes are turned on and off) in Alzheimer's. While the gene activity data were reflected in the protein modules, most modules altered in Alzheimer's proteins were not seen in the gene data. These included modules associated with microtubule function, RNA/DNA binding, and inflammation. Some of the "protein-only" modules were enriched with blood proteins that were likely deposited in the brain following breakdown of the blood-brain barrier, the authors write. They also speculate that discrepancies between RNA and protein networks could come from a spatial mismatch between cell bodies (where the genes are) and degenerating axons where proteins are supposed to be produced. By mapping known genetic risk factors for late onset AD onto both the protein and RNA networks, the scientists saw patterns pointing to the importance of microglia and oligodendrocytes, cells of the brain that produce insulating myelin sheaths around neuronal axons. In contrast, similar analyses using genetic risk factors for autism spectrum disorder and schizophrenia emphasized neuronal rather than glial biology. "At the systems level, we see a convergence in both the transcriptome and proteome on networks associated with inflammation and glial cells, further highlighting the importance of non-neuronal drivers in Alzheimer's pathogenesis," Seyfried says. The researchers are now seeking to move their findings into the clinic. Some of the signature proteins seen in AD brain have been previously detected in blood plasma or CSF (cerebrospinal fluid), and could serve as excellent candidate biomarkers, Seyfried says. Measuring these markers in patients' blood or CSF could provide the basis for tests that would help doctors diagnose or even predict AD before the onset of symptoms. In addition, the proteomics data generated by the Emory team is being used to validate and prioritize new targets and mechanisms in the Accelerating Medicines Partnership consortium. The Emory team is expanding the project to include thousands of new study participants, using more advanced mass spectrometry techniques. Co-lead author Eric Dammer, PhD, instructor in the Department of Biochemistry, collaborated closely with co-authors Vivek Swarup and Dan Geschwind from UCLA to generate protein and RNA networks. Juan Troncoso from Johns Hopkins and Madhav Thambisetty of the National Institute on Aging characterized the BLSA cases. Other Emory authors included Duc Duong, Chad Hales, Thomas Wingo, Jonathan Glass, Marla Gearing and Jim Lah. The research was supported by the National Institute on Aging (Accelerating Medicine Partnership: U01AG046161-02, the Emory ADRC: P50AG025688), and the National Institute of Neurological Disorders and Stroke (P30NS055077). Seyfried is also jointly funded by grant 11060 from the Alzheimer's Association, Alzheimer's Research UK, the Michael J. Fox Foundation, and the Weston Brain Institute.